Tunbridge Wells is located in Kent about 40 miles south-east of London, and situated in a pleasantly wooded district. In the seventeenth century, before many fine trees were cut down to provide fuel for iron-smelting, there was so much timber that woodwork became the town’s staple industry. For over two hundred years, local makers specialised in this distinctive wooden ware which has become known as Tunbridge Ware. The rise and fall of this craft was linked to tourism, developing techniques and eventually changing public tastes. A mosaic Tunbridge ware games box, c.1840, of octagonal shape, decorated with a central flower panel within a foliate border, containing contemporary playing cards and carved mother-of-pearl counters of different shapes, including fish, the base with a paper label for ‘Edmund Nye’. Sold for £1,650 at Sworders, October 2013. A special kind of Tunbridgeware had undoubtedly been made in the neighbourhood for many years before the mention of it by Celia Fiennes, who gave an account of a visit to the place during the reign of William and Mary in her famous book Through England on a Side Saddle. She says she saw “all sorts of curious wooden ware which this place is noted for.” Another observant diarist, Fanny Burney, also noted, in 1789, that the Tunbridge ware shops were a feature of the town. A street market formed one of its attractions, and here the crowd of fashionable idlers used to buy gifts for members of their families who had remained at home. Such gifts were known as “Fairings ” and consisted of toys and dainty pieces of bric-a-brac from local workshops. Celia Fiennes mentions that the Tunbridge woodwork of her day was “delicate, neat and thin ware of both white and Lignum Vitae wood.” The first Tunbridge wares were undecorated but in the second half of the 1700s more decoration appeared. Some were painted in colours on a whitewood background or painted in black to imitate oriental styles. Print decorated wares also emerged in the 1800s, often showing views of Tunbridge Wells and other local attractions. The district possessed a number of very skilful woodworkers and cabinet-makers, and it was one of these, a certain William Burrows, who devised an ingenious method of decorating wooden articles with a species of mosaic. He founded a factory and saleroom at Gibraltar Cottage , where he began to turn out specimens of his improved Tunbridge ware. Mosaic, of course, means a picture or design created by the fitting together of hundreds of pieces of marble, wood, or other suitable material. Each separate fragment had to be laboriously fitted into its place until the picture was completed. Even then only one mosaic resulted from days of toil. To get over this difficulty Burrows hit on the scheme of assembling a number of thin strips of appropriately coloured woods into a block, about twelve to eighteen inches deep, so that their ends made up the desired scene or pattern. Bound, and glued under pressure, the strips were finally formed into one compact whole. A circular saw was next employed to shave off wafer-thin slices from across the block, and each of these layers now became a veneer which could easily be glued to the article it was to decorate. The final stage consisted of hand polishing, a process that called for much experience. In time the quality of the ware declined, polishing was replaced by the use of varnish, which was easily chipped or scratched. The drawing from which the craftsman made up the design was divide up like a Berlin woolwork pattern. The method, of course, required extreme skill, particularly in selecting and arranging the various wood strips in the correct colours to take their particular places in the design, but once the block had been assembled and the layers of veneer cut from across it , the rest was simple to a trained cabinet-maker. An immense variety of woods, British and foreign, were used , and in only one case was the natural colour tampered with white holly was stained with Tunbridge mineral water to give it a unique shade of grey. Green was obtained from fallen oak branches stained by a fungus which imparted a rich shade of the required colour. William Burrows had a brother, Humphrey, who also began to make the ware at Jordan House, and the story goes that one of their apprentices left his employment and made known its mysteries to one George Wise, a cabinet-maker living in the neigh­ bouring town of Tonbridge, who later started a rival firm which continued in his family until the death of another George Wise in 1876. Their factory was situated on the bank of the river near the Great Bridge. The manufacture of mosaic ware was also adopted by Messrs. Fenner and Nye, a firm of woodworkers founded in 1720, at their factory on Mount Ephraim. Later Edmund Nye carried on alone, until his business was finally acquired by Alderman Thomas Barton in 1863. 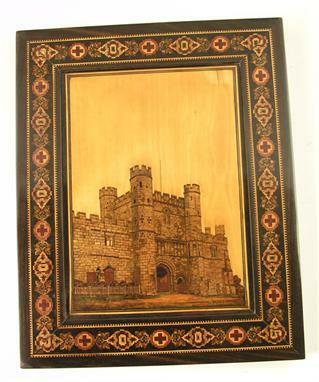 A 19th century Tunbridge ware panel depicting Battle Abbey Gatehouse attributed to Fenner & Nye. Sold for £900 at Wolley and Wallis, January 2010. 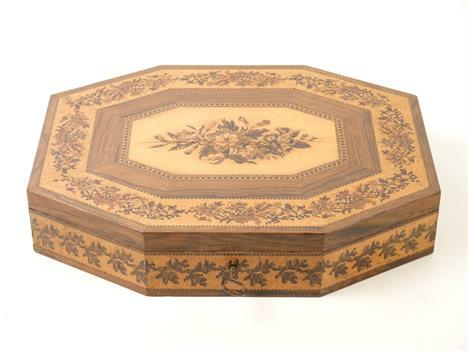 Tunbridge ware’s popularity grew over the 1800s and it was even favoured by the young Princess Victoria. Local makers drew lots to present Princess Victoria with a single example piece of their artistry. A work table described as ‘veneered with party-coloured woods from every part of the globe’ and ‘lined with gold tufted satin’ was given to the royal visitor. At the Great Exhibition of 1851 Tunbridge ware was represented by three major manufacturers: Edmund Nye, Robert Russell and Henry Hollamby. Edmund Nye exhibits included an elaborate “Marine Table,” a wonderful mosaic of a sailing ship at sea consisting of 110,800 pieces of wood. Besides this masterpiece there was a book stand decorated with the representation of an Indian butterfly which, with the pattern surrounding it, was made from 11,000 pieces of English and foreign wood. Also there was a superb workbox decorated with a view of the ruins of Bayham Abbey. This was made of 15 ,000 pieces. 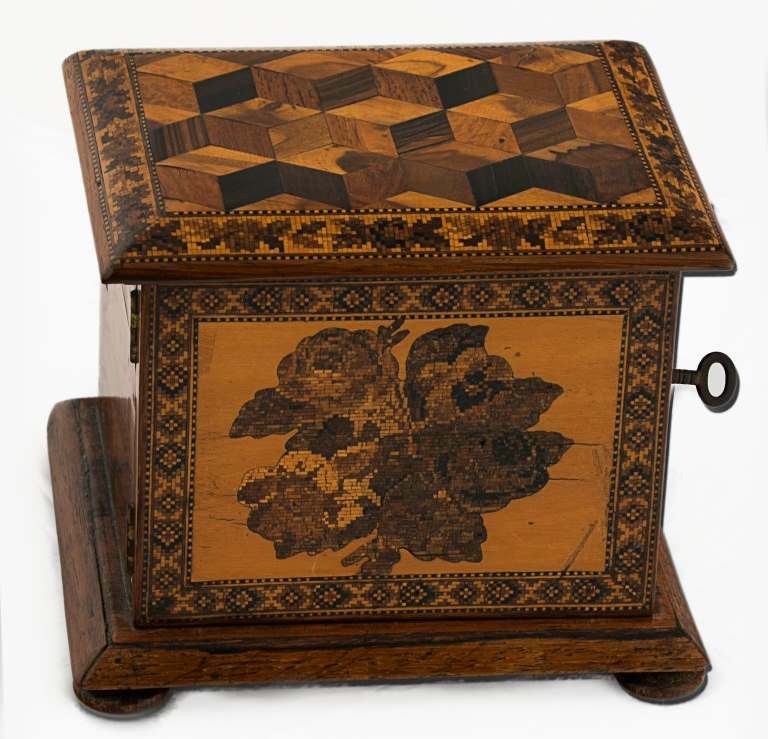 A Tunbridge Ware maple stationery box by Henry Hollamby, the cylindrical top with tessarae rose spray within tessarae cross banding, the sides with broad rose and scroll border. The underside with rare Hollamby paper label, complete with key. 160mm x 110mm. Sold for £650 at Dreweatt Neate, October 2002. Tunbridge ware could be had in a variety of objects. Tables, tea caddies, rulers, workboxes, holders , fruit or bread baskets, candlesticks, chess tables, pencil boxes, stationery cabinets, and pin trays were but a few of the many items decorated with wood mosaic. At first the designs were of a simple type and were often geometrical, such as a clever arrangement of piled cubes, but as the workmen became more expert an effective pattern representing wool-work was used. Pictures in mosaic of places of interest were another addition. Burrows produced a very fine picture of Gibraltar Cottage on some of his boxes and table-tops, while both he and the various other firms introduced fine views of the Pantiles, Tonbridge, Eridge and Warwick Castles, the Pavilion at Brighton, and the ruins at Tintern and Melrose. Sometimes the mosaic picture was replaced by a view which had been put on with a transfer, a far quicker and more economical method. 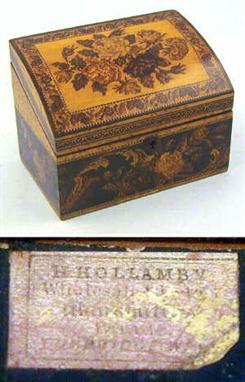 A Tunbridge ware coromandel ‘Pantiles’ mosaic box, attributed to Henry Hollamby, 10.5in. Sold for £480 at Gorringes, October 2015. The Great Exhibition of 1851 seems to have been a turning-point in the manufacture. After this event the beauty and fine workmanship of the articles slowly declined. 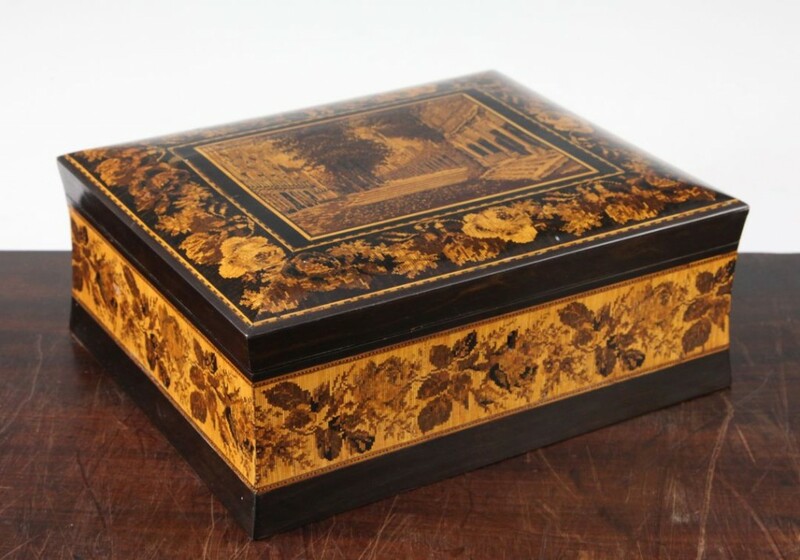 As other novelties became the fashion Tunbridge ware waned in popularity and eventually died out altogether, as did so many other things that were made in those more leisurely times. By 1900, the great days of Tunbridge ware were over. Public tastes had changed and after 1903 there was only one surviving firm of makers: Boyce, Brown and Kemp. A 19th century Tunbridge ware table cabinet, decorated with tumbling cube and floral sprays. Sold for £320 at Holloways, June 2018.